Recorded at the London Science Museum, June 23rd, 2012. Jonathan Sterne reads an extract from from the introduction to his book: MP3: The Meaning of a Format. “At the moment I write this sentence, there are about 10 million people in the world sharing music files over Gnutella, a peer-to- peer file-sharing network. Over the course of a month, that network will move 1 to 1.5 bil- lion music files—and that is only part of its traffic. Add the people who trade MP3 files via BitTorrent, one-click sites like Rapid- Share, and older protocols like Internet Relay Chat and Usenet, and the Gnutella network statistics capture only a small proportion of the overall traffic in MP3s. Measured against traditional cd sales or paid-for downloads, online music sharing alone dwarfs the out- put of the recording industry. The MP3 is the most common form in which recorded sound is available today. More recordings exist and circulate in MP3 format than in all other audio formats combined. A single file on a single network may be available simultaneously in dozens of countries, without regard for local laws, policies, or licensing agreements. Jonathan Sterne teaches in the Department of Art History and Communication Studies and the History and Philosophy of Science Program at McGill University. 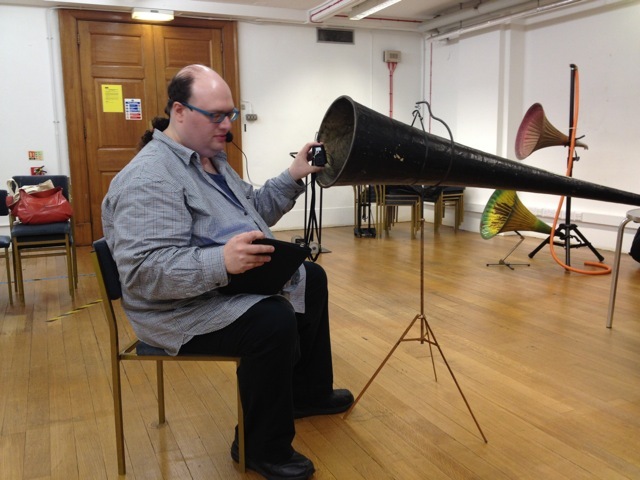 Key works: Jonathan is author of The Audible Past: Cultural Origins of Sound Reproduction (Duke, 2003), MP3: The Meaning of a Format (Duke 2012); and numerous articles on media, technologies and the politics of culture. He is also editor of The Sound Studies Reader (Routledge, 2012). “My work is broadly concerned with the form and role of communication technologies in large-scale societies. One of my major ongoing projects has been developing an adequate history and theory of sound in modernity. Beyond my work in sound and music my interests are in cultural studies of media, technology, science and medicine; “new” or “digital” media (though I’m not entirely comfortable with either term); cultural theory; disability studies; and politicized criticism of everyday life.” J.S. Recorded on an original brown wax blank cylinder from the early 1900s. Jonathan used a personal voice amplifier and read from an iPad. He was keen to make this record partly because someone had asked him when his new book would be out on tinfoil. 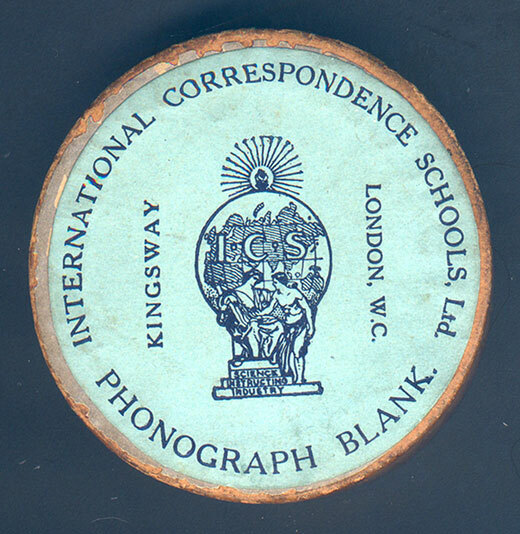 The wax blank came from a box labeled: “International Correspondence Schools Ltd, Kingsway, London W.C.” and dates from ca.1910. The I.C.S. taught over 200 subjects “by means of correspondence”, and “Modern Languages by means of Edison’s repeating phonograph with special attachments designed for Language Study which renders the Phonograph a fit substitute for the living voice.” Source: The Singapore Free Press and Mercantile Advertiser (1884-1942), 8 July 1911.